The number of businesses in China is growing faster than any other major economy in the last year, as it has shrugged off the impact of its economic slowdown, reveals a new study by UHY, the international accounting and consultancy network. According to UHY, there has been a 19% increase in Chinese business numbers in the last year. 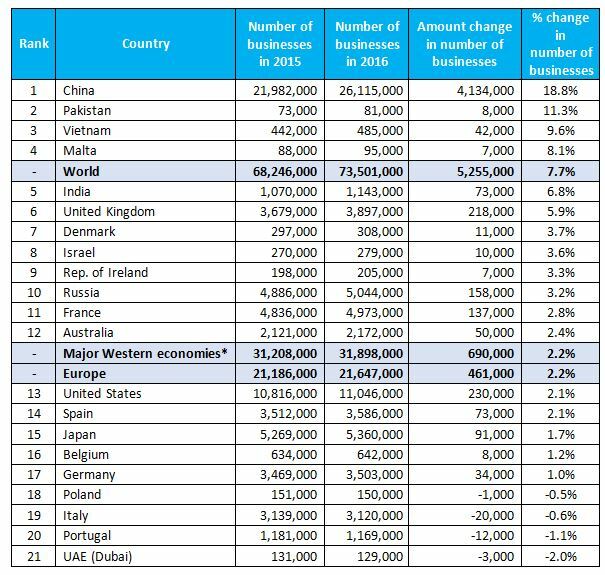 There were over 26 million Chinese businesses in total in 2016 compared to almost 22 million in 2015 (see table below). In comparison, the major “Western”* economies studied saw their number of businesses increase by just 2% last year compared to the previous year. 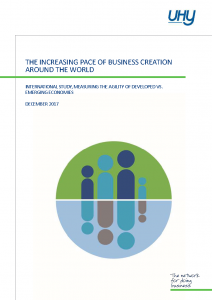 Overall across all countries in the study (21), business numbers in 2016 increased by 8% on the previous year. UHY says the figures suggest efforts to grow the consumer economy in China and policy moves to boost entrepreneurship to drive growth have paid off. The Top 5 rankings in the UHY table for growth in business numbers are dominated by emerging economies. India is, in fifth position with an annual increase of 7% to 1.1 million businesses in 2016 (1 million in 2015). Of the Western economies studied, the UK is first, coming 6th in the UHY table. Numbers of businesses in the UK increased by 6% in the last year, with 218,000 more businesses taking the total to 3.9 million. Greater access to alternative sources of finance such as crowdfunding and P2P lending may be opening up more opportunities for would-be British entrepreneurs. Falling rates of corporation tax have also helped ease the pressure on small businesses and their owners: the UK has one of the lowest levels in the G7 at 19%. However, whether Brexit will slow the rate of growth going forward remains to be seen. The US increased its stock of businesses by 2.1% to 11 million companies, while Japan saw an increase of just 1.7% in 2016, to make a total of 5.4 million businesses. Germany, widely seen as Europe’s economic powerhouse, saw business numbers grow by only 1%, lagging behind most other European countries in the study including France, Spain and Ireland. It increased its stock by 34,000 companies taking the total to 3.5 million. Established in 1986 and based in London, UK, UHY is a leading network of independent audit, accounting, tax and consulting firms with offices in over 325 major business centres across more than 95 countries. Our staff members, over 7,850 strong, are proud to be part of the 16th largest international accounting and consultancy network. Each member of UHY is a legally separate and independent firm. For further information on UHY please go to www.uhy.com.